Also known as brindled gnu, blue wildebeest is a large antelope and one of the two species of wildebeest. Native to southern Africa, adult coats range from a deep slate or bluish gray to light gray or even grayish-brown. Both sexes possess a pair of large curved horns. 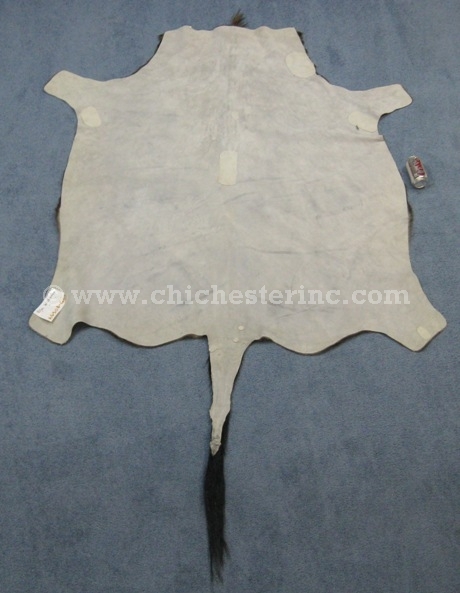 We get in a limited number of blue wildebeest skins from South Africa on a regular basis. These skins are of good quality and ideal for wall or floor decor. Our Gxx codes denote individual pieces. If you would like to order a specific blue wildebeest skin, please go to our Gallery to pick the exact one shown. Genus and species: Connochaetes taurinus. Wild. Blue wildebeest are not an endangered species and not subject to CITES.